One of the major developments of recent years, which has profoundly affected the economic and social life of Vauxhall, is the establishment of the New Covent Garden market. It has firmly implanted itself into the local scene, providing numerous jobs and demanding new services in terms of transport, catering and cleaning. Many local residents were relieved at the final closure of the old Nine Elms locomotive depot, with its constant noise of engines shunting, hooting and bumping coal wagons about. In its place, the roar of juggernaut lorries converging on the redeveloped site seems to many a doubtful improvement. There is no doubt however from the traders’ point of view that the New Covent Garden is a success, and a great improvement compared to the crowded old site off the strand. The rapid expansion of London’s population in the early 19th century brought a booming demand for fresh vegetables and fruit. In 1828, statutory powers were obtained authorising the construction of a new market building which was completed by St Paul’s church Covent Garden in 1830. During the following 50 years, extensions and additions were made several times, but their capacity was soon outstripped by the growth of business. Profits from the trade were steadily used to acquire other Covent Garden buildings and convert them to market uses. Traffic problems became acute in the motor age, as larger and larger vehicles attempted to penetrate streets designed for horses and carts. The market buildings became worn out and unable to accommodate mechanical handling aids. In post-war times, the reaction to this pressure was initially to plan a new market on the same site. The Covent Garden Market Authority, set up in 1961 for this purpose, soon found the idea impracticable and alternative sites were investigated. Ten years later, with parliamentary authority and government finance, construction of the new market began on the present 68-acre site at Vauxhall. That the redevelopment was badly needed was shown by the letting of virtually all the trading space – amounting to 400, 000 square fest – before the market was opened. Many new wholesalers from other markets also transferred their business to Vauxhall. 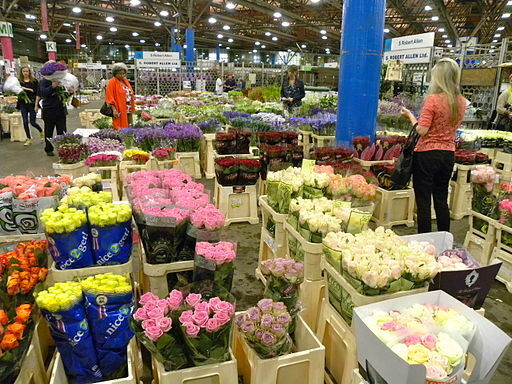 Business at the New Covent Garden market has increasingly taken on an international flavour, accelerated no doubt by Britain’s entry into the Common Market in 1973. It handles a substantial proportion of all the fruit and vegetables imported into the UK; it also affords the largest single concentration of buyers and sellers, and the widest selection of market produce in the country. Consequently, it has a key role in the setting of prices nationally for such goods. The market has three components. the entrance yard covering 7 acres, the fruit and vegetable market extending over 45 acres, and the 16-acre flower market with the office block known as ‘Market Towers’. The main railway line into Waterloo station bisects the site, and tunnels beneath it link the different parts. By contrast with the old Covent Garden, the wide roads and parking for over 1,000 commercial vehicles allows quick and easy movement through the market. Closed circuit TV and VHF radio are used to monitor traffic, as well as to aid security. To provide for the 250 trading organisations and their 3,000 staff, the market incorporates its own banks, restaurants and other amenities. One of the points of architectural interest is the Flower Market, which has a fluorescent glass-reinforced polyester roof to give the maximum natural light. This is augmented by colour-corrected lighting which adjusts in intensity as the natural light changes. The hall has air-conditioning also which is intended to help maintain the flowers and plants in the best condition, and outside, canopies cover the loading areas to give protection from the weather. It is claimed for the market that the greatly improved facilities have led to greater efficiency, better quality produce and lower distribution costs. This article appeared in the October 1979 edition of the Vauxhall Society’s Newsletter. We are indebted to the GLC Horticultural Society for material used in this article.